While scrolling through my Facebook feed, I saw that Mike Mullin (author of the awesome Ashfall and Ashen Winter; yeah, I've met him too!) had posted to his wife, Margaret, about Tom Angleberger (author of Origami Yoda and other awesome books) visiting Zionsville, Indiana. I know that sounds a bit stalkerish, but I was super excited of the possibility that my family could go to Tom's Fortune Wookiee event at a bookstore only about an hour away! I tweeted Tom to see if he was indeed visiting my state. He let me know he had missed his flight and he *thought* he would make it. Later he tweeted again and said he'd definitely be there but would miss his school visit. (I love Twitter. Seriously.) We decided to drive south and go meet this awesome author. Back story: Neither of my children have read anything by Tom Angleberger. Why? Well, my son is 6 and to me the Origami Yoda series is pretty middle school/upper elementary type reading. My daughter (11 and now a 6th grader) hasn't been interested in the Origami Yoda books but I thought she'd enjoy Horton Halfpott. Even so, this "meeting an author" thing is pretty exciting for all of us, including my husband. We got to the bookstore (really neat place: 4 Kids Books & Toys!) and were directed to the backroom. Only a few parents and kids were there but it began to fill up. 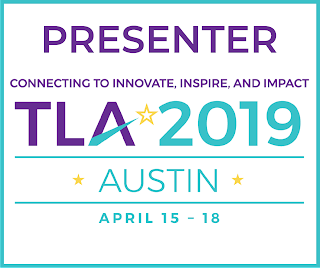 I was tickled pink when I went up to meet Tom (wearing my League of Librarians t-shirt) and he said, "Oh! You're part of the League of Librarians?!" I told him I was @LibraryFanatic and I loved his books. The room began to fill up and it was time for what Tom called his "dog & pony show". He did NOT disappoint us! He made us all laugh as he told stories, told about his stories, drew pictures, said funny things, and folded a giant origami Yoda. Now both of my children can't wait until I read Fake Mustache to them. My husband is kind of excited about hearing that book too. Other cool stuff: I got a picture that Tom drew of Lady Luggertuck! I'm going to frame it to hang in my library. I ended up purchasing 3 copies of Fortune Wookie (1 for a friend, 1 for my school library, & 1 to give away in a drawing at school) plus a copy of Fake Mustache for our family. 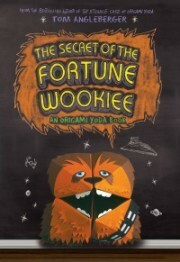 We all got our own Fortune Wookies to fold and several mustache and Fortune Wookie tattoos. Tom signed and drew in all of my books. So awesome! It was definitely an evening to remember. Meeting authors is one of my very favorite things to do! Hopefully we'll be able to go to another author event soon!